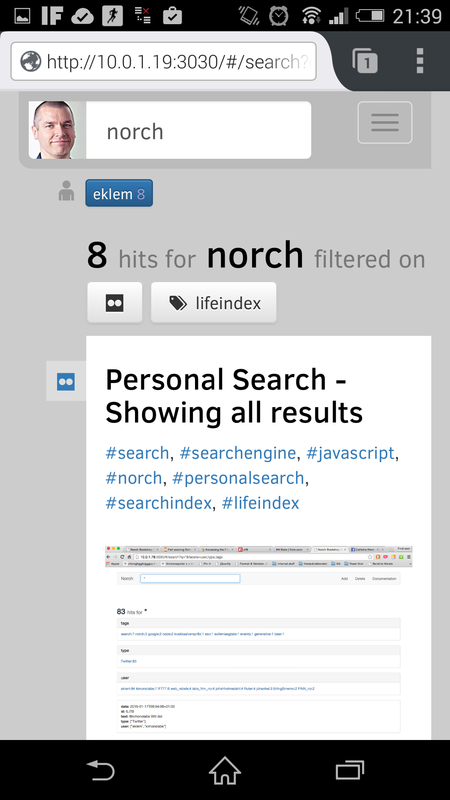 Which sources are good for a personal search? 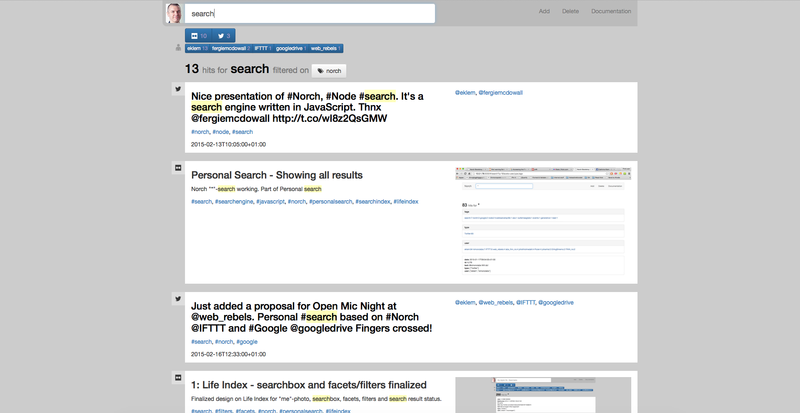 Since last time, I’ve gotten a search up and running, and styled search box, facets, filters and search results. I’m indexing starred Gmail, Twitter tweets and Flickr uploads. But which sources do you want? Life Index is all about being your search solution. Which sources would be good for you. Please feel free to post your suggestions at the bottom. The feedback is most welcome! Search user interface more or less done for now. Calendar events, phone log over incoming and outgoing calls, Facebook, SMS’es, Facebook updates, Youtube uploads, Vimeo uploads, blog posts, blog post comments, Evernote, Instagram, Google Plus, Foursquare etc. Most important part of the answer: Why? This is sometimes hard, but why are these sources important to you, and how would you benefit from having them searchable. For me it’s not given which sources that are actually usable. Examples on stuff I thought would be nice is i.e. SMS’es. For me they’re just way to personal to have available in a search, even if only I can search them. Another example is all my email. I get and send some interesting emails, but mostly email solutions are garbage cans for other online services. So, what’s important for you? And then why and in what ways? Thanks Frezno! I’ll make indexers for some of these quickly. Also, erikperez is having a go at making an indexer for the online version of Outlook. Contacts could be a little more difficult, but I want to connect users and content, so this will happen. CONTACS (from different sources like Outlook, iCloud, Google, FB, LinkdIn, Skype) – because I tend to store contact info everywhere and I never know which is updated. MESSAGING (from different messaging services like mail, SMS, FB messages, Google talk, Lync etc.) because the conversation is volatile in nature, but in many cases it is the only documentation from meetings, discussions etc. I search through old conversation more and more looking for important/useful pieces of information. Contacts are good! Was looking a little into how to normalize/unify an actual person across different contact lists. No easy way to go about it, but I’ll test out a manual setup to see if it actually is useful. Maybe calendar API’s will give me this in the future. Then you can find a person, either through other content or direct search, and look into all your discussions with this person across different sources/services. Checked among my friends and contacts, and a vast majority uses either Gmail or Outlook/Office365, or a combination. I’ve created a crawler for starred Gmail and an ex-colleague of mine is almost finished with a crawler for Outlook/Office365. I’ve tested SMS, and found it a bit creepy, but it’s easy to add as an option.